This is nonsense. American war aims, the rhetoric of the war hawks notwithstanding, did not centre on annexing the colonies of British North America. 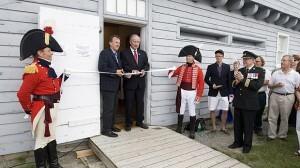 Carl Benn explains that the Americans intended to occupy Upper Canada, and perhaps Montréal, in order to force the British to give in on other more important issues, namely, American territorial expansion to the south and west, as well as freedom for American transatlantic commerce (The War of 1812, 2003). It is also clear that President James Madison deliberately fanned the flames of nationalistic fervour in an effort to win re-election (which he did). Alan Taylor has shown that the conflict was as much civil as foreign, with the inhabitants of both sides split on who to support or whether to get involved at all (The Civil War of 1812, 2010). The Canadian Press Images PHOTO/Parks Canada – Click Image for its original context. The experience of war was markedly different for the various colonies of British North America – the Maritime region was hardly touched, while some parts of Upper Canada were razed. There was no doubt a shared sense of relief when the war ended, but to extend this to a shared experience and relationship leading to Confederation fails to take into account the profound political, economic and social differences that existed within and between each colony and the numerous events and decisions that happened between 1815 and 1867. At best, it is wishful thinking; at worst, it is an insult to anyone who does not reside in southern Ontario. The government makes even more ridiculous claims on its website – that had the war ended differently, “Quebec’s French-speaking identity would not exist” and that First Nation military support during the war led to modern Canada’s respect for the “rights of aboriginal peoples.” For the latter statement, we could debate both the link between the two subjects as well as our supposed later “respect” for the rights of First Nations given our all-too modern history of reserves, residential schools and racism. Tecumseh’s dream of a large, economically viable and politically autonomous aboriginal territory died with him in 1813. The government’s abuse of history has already generated numerous scathing responses from historians and journalists alike. It makes me mad too. But it also makes me think about modern Canadian nationalism. In some ways, the commemoration is quintessentially Canadian because we are defining ourselves by what we are not; in a phrase, the war was our struggle to be “not-American.” Everybody loves an underdog story, especially the underdog, so we recount how plucky militia and savvy native warriors helped a handful of British regulars defend their freedom against overwhelming odds. We do not pay quite so much attention to how thousands of British veterans from Europe took the war to American soil and ended it there. Perhaps Canadians should thank Napoleon for invading Russia; the war in North America may very well have turned out differently if he had not led La Grande Armée to disaster. This underdog story is so compelling today because we continue to be anxiously aware of our large, ponderous neighbour and indeed, of Canada’s relative marginality in the world of global politics. The declaration “we won the War of 1812” echoes Canada’s contemporary efforts to be recognized on the international stage. Recent examples include our insistence to take on the more dangerous and challenging Kandahar during the mission in Afghanistan and our decision to cut diplomatic ties to Iran ahead of our allies. Many have long argued that we punch above our weight as a “middle power” in the world. What this means and how much it is really believed inside and outside of Canada are open to debate. On the other hand, and perhaps most Canadian of all, is the refusal of most people to pay attention despite the government’s best efforts to promote nationalism. A poll undertaken by National Defence and published by CBC shows that “few Canadians” are aware of the War of 1812, even in southern Ontario where most of the battles were fought. How did the Treaty of Ghent create the foundation for two centuries of peace with the United States? How did ordinary soldiers and non-combatants experience the war, and can this help us to understand the situation and needs of people caught in current war zones around the world? What were the political, economic and social origins of the war? How was popular support for the war created? Can we apply the results to anticipate or avert future wars here and elsewhere? How did different levels of government and military leadership work together (or not) to coordinate the war effort and to conduct relief and reconstruction operations after the war? How does this compare with current emergency measures and strategic planning capabilities in Canada? As historians, we will probably fail to convince the government to stop abusing history. The greatest challenge for us is not how to refute the government, but how to engage the public in a meaningful discussion about our past that is relevant to current interests and needs. If we fail to convince the public that there is a better use for history, then people will continue to believe what is presented to them or (more often) ignore the past entirely. They will thus go forward to tackle today’s problems blind to the lessons, the strength and, most importantly, the perspective that we can gain from our past accomplishments and mistakes. Finding answers to today’s serious geopolitical, economic and environmental challenges will force us to work together in ways that we did not during the War of 1812. Exploring and accepting the ambiguity and the diverse experiences of that war can lead to useful discussions of Canadian identity, culture and collective action in the modern world. But maybe this is all a missed opportunity. The centennial of the First World War approaches, and soon everyone will forget about the War of 1812, at least until 2062. Can historians do better with the “war to end all wars”? Adam Chapnick, “The Canadian Middle Power Myth,” International Journal 55, 2 (Spring 2000): 188-206. Well written Greg. It never ceases to amaze how government tries to tell us how to interpret things instead of presenting the information and having meaningful discussion on those topics. Valuable info. Lucky me I discovered your web site unintentionally, and I’m shocked why this twist of fate didn’t happened in advance! Hello Prof. Kennedy. I am a US American and an amateur historian for a long time. I really like what you have mentioned about the War of 1812, and I for a long time I only learned from professional historians such as you. What you have written did open my eyes some more about what really happened during that time. I will close by saying this: I may be one person, but I really want Canada and the United States to remain good friends.